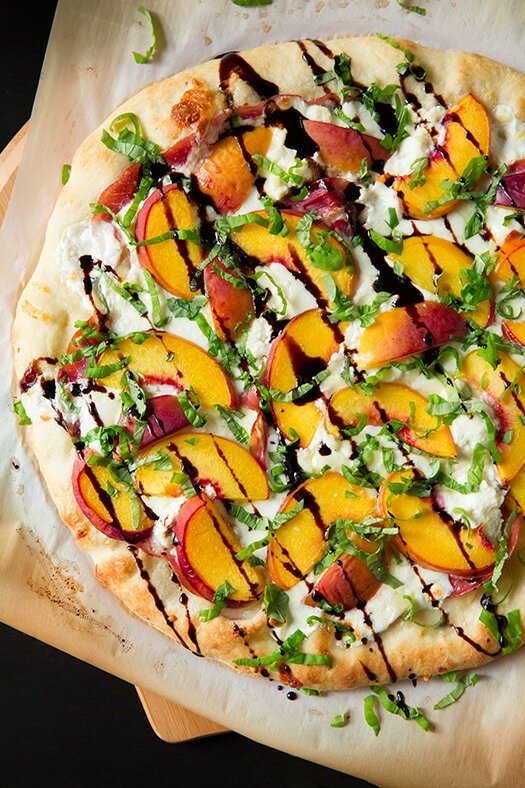 This Peach and Prosciutto Pizza is topped with three types of cheese and a homemade balsamic reduction. 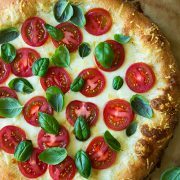 This is the perfect summer pizza recipe! If there were an ultimate summer pizza, I’d have to say this should definitely be it! I couldn’t believe how amazingly delicious this fresh peach pizza was! I’m thinking this should now be added to my menu on a weekly basis. 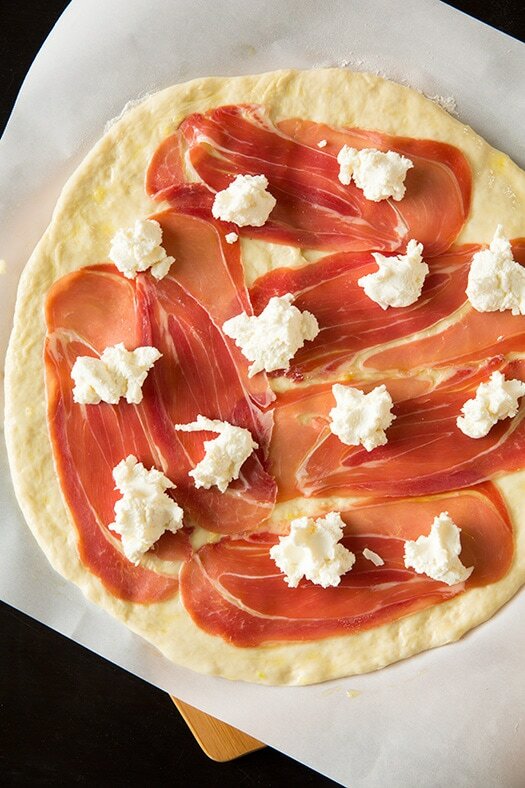 Just imagine a soft pizza crust topped with garlic oil and layered with delicately thin slices of irresistible Italian prosciutto. Then cover that with three cheeses (this time around, ricotta, fresh mozzarella and asiago, all of which perfectly complement peaches) and top it with plenty of fresh peach slices. Then take that and bake it in a blazing hot oven to golden perfection, which will give you that crave worthy deliciously melted cheese and sweet and tender roasted peaches. And now, finish that all off with a generous amount of fresh basil ribbons and a honey balsamic reduction to die for. Yes, it’s a pizza you’re not going to forget. 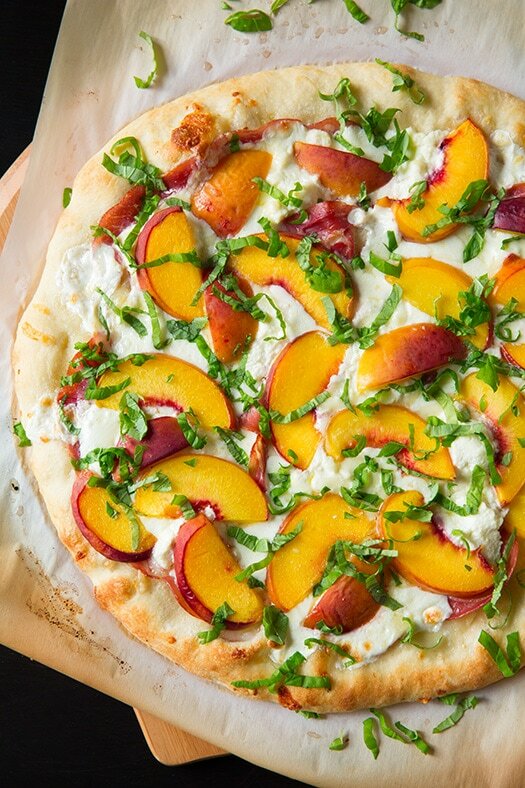 This peach and prosciutto pizza is pizza done right! Pizza is so much more than just tomato sauce, mozzarella and pepperoni. It’s a world of endless possibilities. So, step outside of the comfort zone and make something a little different this time around. You won’t regret it! Preheat oven with pizza stone inside. Stretch pizza dough over lightly floured piece of parchment paper. Brush with olive oil and minced garlic. Season with salt and pepper, then lay prosciutto onto crust. 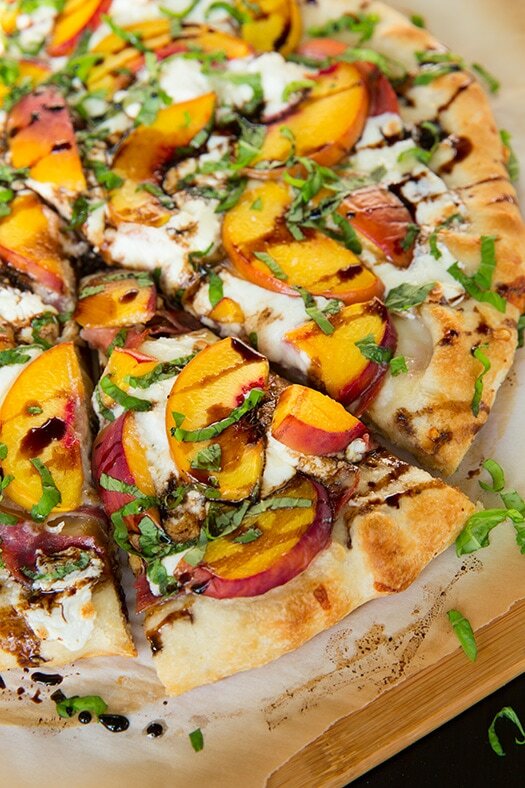 Dollop ricotta onto pizza, then add the rest of the cheese and sliced peaches. Bake on preheated pizza peel until the crust is golden brown. Sprinkle pizza with fresh basil and balsamic reduction. Pour balsamic vinegar and honey into a large, deep skillet. Allow the mixture to simmer for around 15 minutes, or until the vinegar has reduced. Can I Use Canned Peaches on This Pizza? No, canned peaches contain too much liquid. 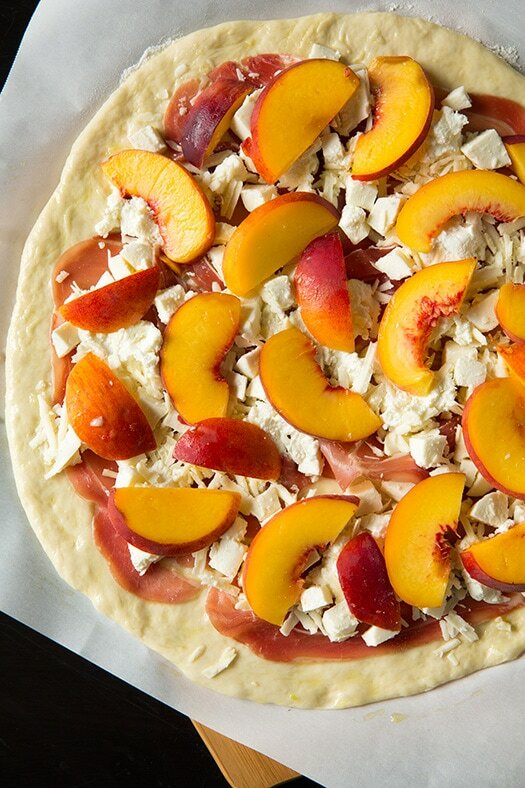 You’ll need to use fresh peaches for this prosciutto pizza recipe. Can I Find Balsamic Reduction at the Store? 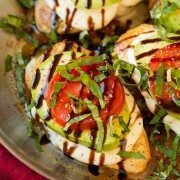 Yes, if you don’t want to make homemade balsamic reduction, you should be able to find it at your local grocery store (likely in the same aisle as the vinegars). Use a silicone spatular to stir the balsamic reduction. You’ll be able to scrape down the sides of the skillet more easily that way. You want to slice the peaches fairly thin for this recipe, otherwise they won’t cook enough in the oven. There’s no need to peel the peaches before adding them to the pizza. The perfect summer pizza! 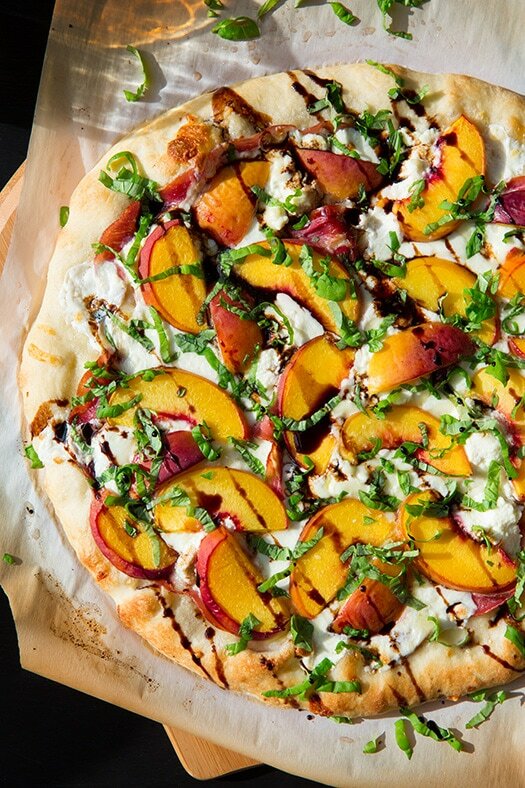 Layered with cheese, sweet peaches, fresh basil and a tangy balsamic reduction. Place pizza stone in oven and preheat oven to 450 degrees. Let pizza stone preheat with oven and rest 30 minutes (assemble pizza during last 10 minutes or so). Meanwhile, pour balsamic vinegar and honey into a large and deep skillet. Set skillet over medium heat, allow mixture to cook and simmer, until reduced to slightly under a 1/2 cup, about 15 minutes (I recommend using a silicone spatula to stir, so you can scrape bottom and sides of pan while stirring. Stir mixture occasionally during first 5 minutes, then stir constantly during last 10 minutes). Lightly dust a sheet of parchment paper (about 14-inch long) with flour. Stretch and shape dough into a 12 1/2-inch round. In a small bowl, stir together olive oil and garlic. Brush mixture evenly over top of crust, working to evenly distribute garlic. Season crust lightly with salt and pepper. 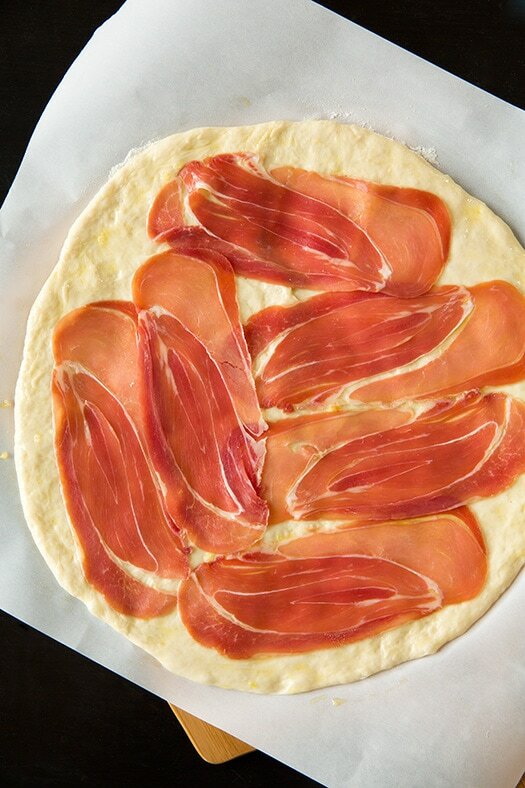 Layer prosciutto over crust into an even layer, aligning pieces side by side (if they overlap slightly that's fine). 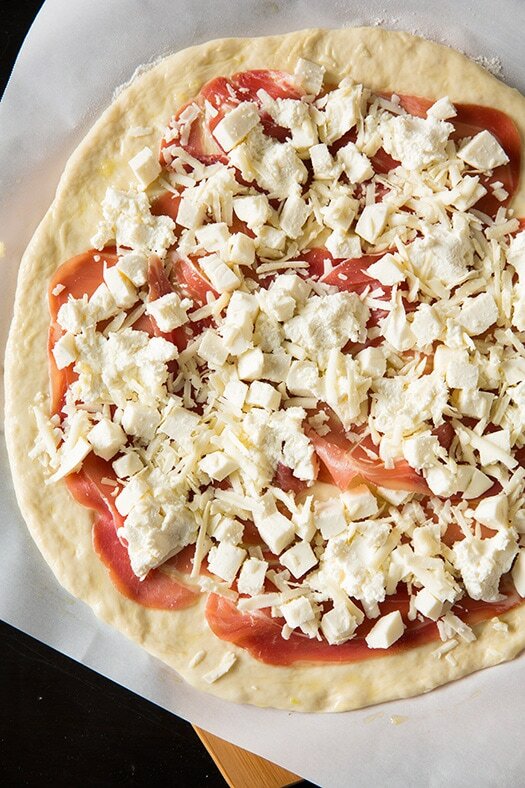 Dollop small portions of the ricotta over pizza, then sprinkles with mozzarella cubes and asiago cheese. Cut peaches in half and core. Laying peaches with sliced side down, cut peaches into slices (slightly over 1/4-inch thick). Layer peaches evenly over pizza. Using a pizza peel, transfer pizza on parchment to preheated pizza stone in oven. Bake 10 - 12 minutes until edges are lightly golden. Remove from oven, sprinkle with fresh basil, and drizzle with honey balsamic reduction (store left over reduction in fridge). Cut into slices and serve warm. *There's no need to peel the peaches before adding them to the pizza! Stephanie: Tested this for Christmas entree and it was amazing! Used my own pizza base, omitted the mozzarella and used parmasen instead of asiago but it was absolutely incredible!